My hands were shaking as his words played over and over in my head. “This will save her if she gets in trouble. It should keep her from dying. Good luck.” I clutched the device in my hands the entire way home- 2 hours- as if clutching it in my hands would somehow keep my baby alive just by the action of holding it. The thought of using it to save her was almost as terrifying as the thought of losing her. Almost. She was not quite 2 the first time it happened. There are pictures, though 9 years later I still can’t look at them. We were on a dream vacation. A cruise after a week in the happiest place on earth. Our last formal dinner. She stole bites of my food and giggled, ate happily, played with her Papa…slowly she became irritable though, and for her that wasn’t too unusual. She was tired. Then, hives began to show up on her sweet baby cheeks, her chin, and soon her entire body. We left that beautiful dining room and called the on ship doctor. He was out. His nurse barely spoke english. He wasn’t sure what was wrong. For a while things became fuzzy. As we put her in a cold bath and my mom began dumping liquid antihistamines down her throat and I called her pediatrician at $10 a minute from the middle of the ocean. She would be OK. After an hour the hives went down and for the next 2 days we administered more meds every 4 hours. And, we made out first appointment with the allergist. I will forever be grateful for the man who shed light on WHY my baby got so sick eating pumpkin soup- There were hazelnuts in it, nutmeg and who knows what else… She would- at 2 years old- be diagnosed with anaphylactic (life threatening) food allergies to common foods. And, our life, how I mother, how I shop, how I cook, how I do literally every single thing in my own life would change. Although I am grateful for our first allergist, he lacked a practicality or even bedside manner that a new mom needed. I remember crying when I got home and telling my mom I was scared to ever feed my baby again because his good luck statements made it feel like feeding her was risking her life. I felt like food for us became the same training you use with teaching kids something is hot. ” Don’t touch, HOT” for us was ” Don’t touch, it could make you sick”. Unfortunately it bred a fear based home life for all of us. There are so many, many instances I could share on how scary things have been- like the time she ate a muffin and started choking saying her throat was “funny” and couldn’t breathe as we were driving in the car on a back road 30 minutes from any sort of emergency medical teams. Or, the time I tried to train a babysitter with the epi-pen and it for whatever reason exploded the orange I was using in my hand and left us all TERRIFIED of what would happen if we ever had to inject her without assistance. Or, how about the time my son had a total breakdown at school because he ate a peanut butter treat and thought if he ever touched his big sissy again she would die. Scary, sad and sometimes, very hard. I have been called helicopter mom and much worse. I have had MONTHS where I couldn’t leave her with anyone because everyone was afraid to feed her. We’ve had 3 counselors now to help us navigate anxiety. And, thankfully now have one who is really making progress. We have a great allergist we love now whose approach to life with allergies has given us glimpses of feeling like we are normal. The anxiety over food has caused enough issues I have worried I have failed completely as a mom. Her anxiety over food in general had her labeled failure to thrive for a while. Lovely thing for a 10 year old. Here’s the thing. Shes 11. She’s OK. We’ve learned how to deal. There are some things I wish people understood about her. If you’re curious what an allergy mom wishes non-allergy moms knew- read on. #1- We aren’t being dramatic. We’ve watched food almost kill our children more than once. And, it’s scary. And, it’s our job to protect them. #2- We didn’t choose this. It isn’t a fad for us. We were allergen aware before it was cool and we will be after. For us it isn’t cool. It’s awful. It’s limiting and frustrating. #3- Yes, one bite can kill her. Or, in her case 1 drop of sesame oil could trigger a reaction we can’t bring her back from. So, yes, if you eat hummus and I ask you not to touch her or she leaves the room- she isn’t being rude and we aren’t being paranoid. #4- In every other way she’s a normal kid- She’s just way more aware of her surroundings than most adults even are. #5- She likely won’t outgrow them. She’s already outgrown the ones she was going to. And, yes, it’s awesome that your aunt has a cousin whose sister outgrew all her allergies. I wish that was what we had to look forward to. But, it isn’t and you telling us to “have hope” only makes her feel like it’s something she should find a way to change. #6 – If you don’t want to keep her safe, I don’t have time or energy to convince you. If you do care enough about us to learn what has to be done- and do it, I will love you forever, because it’s rare and this often feels very lonely. #7- I won’t be ashamed to advocate for food labeling and laws in the U.S. Because quite frankly, it could save her life one day. #8- I’m worried about her future. She won’t be able to kiss her husband if he’s eaten nuts. And, finding a boy who loves her enough to refrain from her allergens- because he loves her is something I think about. So, raise your own kids to understand that LOVE sometimes means sacrifice. Ultimately, the one thing I wish people understood is, for all my helicopter parenting, I am just doing my best to keep her safe. To keep my baby alive. And, I appreciate your prayers and your support. When I seem a little crazy over this, I probably am. We are all trying to be the best parents we can, but, I carry the burden of her dying if I miss something and it’s incredibly daunting. I am realizing as I age that I am sortof a strange mix of personality. I am fueled by my friends and am an out loud thinker. I process better when I talk something through than I do when I process in my own head. However, when I spend too much time with people-even people I love- I get burnt out and drained and long for quiet and warm covers and solitude. I used to write. It seemed like writing was about the simplest way for me to “get it all out” and yet also be alone. I used to just WRITE. For hours. For days. About anything. Lately though, I feel as though every pen in my life has gone dry and I have nothing left to say and yet, a LONGING to just get it all out. I know that sounds… conflicted. I am conflicted. And, I am tired of living in my head and feeling conflicted. Over the course of this school year I will be writing again. I don’t know what might come out. But, I hope there end up being some good nuggets there that encourage. I hope I find myself in the words I type. And, I hope my words can give us something to connect on. Picture this. You are walking along a path headed to a pond. Just as you almost reach the edge, you trip. You roll. You land in a heaping mess with one foot in the water. A little banged up but, not so much that it’s unbearable. You ended up where you were going but, not quite in the way you had in mind. That is how I feel about this autumn. As if, all summer I was headed toward it but in the last several days I have just fallen and become somewhat bungled in my attempt to reach the first day of school still on my feet. This summer was one of those that made memories. I am grateful. It’s sort of funny to me how my body and my heart can crave the schedule, the crisp fall air, chai tea, warm socks, the quiet house…and dread it all at the same time. Fall brings about my creative side though. For me summer is about activity and as the leaves turn and the weather goes from tank tops to turtlenecks (yay, Montana) in the blink of an eye (or rather you close your eyes to sleep with it being 98* and wake up freezing and it’s now 48*) my creative side comes alive and I desire to write again. To paint again. To sit down and read again. So, here we are. Falling into the crisp cool (or if you live where I do the wet and drippy cold) autumn. Welcome back to my blog. And, may you be blessed in the coziness of this season. I feel like I am some sort of anomoly. Too tired to put up much of a fight. Too wary of watching plans crumble to make any. I certainly don’t want to see 2015 stick around. True, there were a few truly great things that have happened. Monumental things. There have also been some really hard, devastating things. Some things that have changed my heart and maybe the way I see the world. Monumental things. I don’t know. There are some good things that have become from the bad things. My view of the world for one thing. I have truly seen some AMAZING things come out of brokeness. People truly putting themselves aside and bearing another persons burdens to the best of their ability. I am not sure how my view of the world was before. I have always tried to be a kind person but, I don’t know. Now, my main goal is to just…Be kind. Period. To Everyone. To my neighbor who I do not like as a person and who has been just downright crazy at times, to the older gentelman who comes into my parents store and asks my opinions of videos and always gives me a tentative side-hug as if he isn’t sure if I will slap him but, it’s the only human to human contact he may have had in days. To the woman who thinks I am her enemy even though I don’t know why. To the bullies and the backstabbers, the cheerleaders and the friends. Of course, there are those who I will be more invested in than others. But, perhaps that was what I learned the most in 2015. You don’t have to be invested to be kind. I suppose that was a good lesson. I wish life hadn’t felt the need to show me so brutally. When you feel others pain deeply, it makes you vulnerable to be hurt deeply when they are. And they were, more of them than I can list. Those I love. Those I *AM* invested in. Those who don’t *deserve* the 2015 they lived. And I was. personally. In the grand scheme of “this pain” vs. “that pain” mine was relaly pretty minimal. So, what will my 2016 be? I have no idea. I didn’t expect my 2015 to be veiled with a curtain of death after death, joy after joy,and tragedy after tragedy and such an emotional roller-coaster. I didn’t expect to spend weeks with family and friends in the hospital, for all sorts of reasons. I would really prefer this year that I never need enter a hospital or funeral home or vet’s office. I am PLANNING to focus on growing my business, simplifying and organizing my home, spending time with and on new friendships and old ones that mean so much and have proven that they are solid and giving from both sides. I plan to be more focused in my devotional time. I plan to eat healthier and lose a little weight. I plan to paint and write. I plan to learn something new, maybe a language, or relearn something that I used to know. I plan to travel. I plan to be careful with my spending and my planning so that when the opportunity comes to be frivolous I can be. But, it really isn’t about *My* plan anyway is it. I plan to be open to change, to better, to memory making. What God has planned for my 2016. I know the feeling well of sitting alone. The way you try not to stare at the other groups of children playing. You try not to be envious of their games. You wish with all of your heart someone would ask you to play. But, you aren’t surprised they don’t. You hold a book in your hands, but, if someone were really watching they would notice you have been on the same page all recess. It is not that the book is too hard, or uninteresting. You simply can’t concentrate. I know how that feels. I have seen you miss the hands of your friends over and over. I have seen the look on your face as you glace to see if anyone has noticed that was your best throw. I know that inside your stomach turns because you know if they ever found out, that you really don’t like football you just don’t want to be alone you would be ridiculed. I wish I could give you a hug as you stand there. You look so uncomfortable as the group you are with is making fun of another student. I wish someone would stop them. I wish you were strong enough to stop them yourself. But, I totally get why you don’t feel like you can. I see the look of surprised terror as you have to brake suddenly because another kid thought it would be funny to pretend to jump in front of your car. You nod your head and pretend to laugh. Catching my eye with a look that says “I know it’s stupid, but, it’s highschool” as you shrug. I hope you realize that it is stupid. And, that next time, you might not stop in time. The fear that flickered across your face? The not knowing how to react will be so much worse if anything ever actually happens. I wish I could tell you that at 30 – none of you will remember you telling that kid to stop- but, every single person in the parking lot will remember forever if you aren’t paying enough attention next time. I see you looking worn and tired. It’s only Tuesday and yet it looks like you have had a month of Mondays. There is just not enough of you to love on every student in the way you know they need. You can’t see every problem or catch each little frown. I smile at you hoping that all my grateful will show. Instead you look like you are afraid to say hello in fear I will point out something you missed. I see you muttering curses and kicking tires. I see the frustration and the anger. But, when you catch me staring, I also see the fear. I hope that fixing your truck is not going to take food from your family this month. I wish I were a mechanic and could fix it for you. But, the best I manage is what I hope conveys encouragement in my nod as the light turns green and I rush off to wherever I am headed. Every day and sometimes more than once I see the things mentioned above. Every day my kids come home from school with stories of how they, or someone they know has been hurt. The world is full of broken and hurting people- and the people who are hurting them. On a global scale the world needs to get it together and realize we don’t have this live in unity thing anywhere close to figured out. On a smaller one I wonder: If the little girl sitting alone had caught the football, would their worlds be better for it? Or if I had stopped and just given the mad a hot cup of coffee before being on my busy way, would it have been enough to turn his day around? Every day my facebook newsfeed is full of people mourning, hurting, broken, breaking, boasting and celebrating. Some of that is just life. But, when your child is rude to my child I wonder… does she know that hurtful girls, without an interruption in their behavior, turn out to be hurtful women? Do the children who pressure others realize that the consequences of unwise choices live like a stain forever- and that they have a ripple effect? I am certainly not perfect. I am certainly not even close. If you’ll remember i drove right past the man on the side of the road and said nothing to any of those I wrote to above. I could have. I didn’t. I regret that. I hoe some day my hurt won’t keep me from reaching out to someone who might need it. I pray that my heart will see that it’s ok to make a difference. Because, I was hurt for trying to do that when I was sitting alone at school, and I am afraid to reach out now to the man on the side of the road. And, I don’t want to be. I am sometimes a guest writer for Bigfork MOPS. I wanted to share with you all what I wrote for them this week! About a month ago I was listening to my favorite Christian radio station and this phrase came into my head “It’s okay to not be okay. We exist to be the example of how God makes something beautiful from broken shards. ” Part of it is from a song. ( by Plumb ) Part of it is just how my brain filtered it and laid it on my heart. I put the phrase on Facebook hoping it would touch hearts as much as mine was. It did and I promised to write a blog on it. So, here it is V. Sorry it took me so long. I get this beautiful picture of Christ, lovingly creating me to be this amazing work of art. And I, not long after He creates me manage to break His work of art. The fact is we are all a little broken. Through ourselves and through other broken people and a world fraught with disaster that often leaves us shattered. The imagery of that can be crushing… I am SO GLAD that God doesn’t just get annoyed and throw us away like we do a favorite coffee cup that has fallen to the floor. The beauty of grace is that God takes our brokenness and turns it into something amazing when we lean on Him to do it. Have you ever heard of Kintsugi? Very simply put ( you can read more about it Here ) it is a form of what is considered to be specialized art. The artist takes BROKEN pottery and using gold puts the piece back together creating a breathtaking work of art that sparkles and is usable again. This is what I picture God doing with us. Every time we are broken. In His love He pours himself out over our broken shards and puts us together again. Oh, the cracks are still there. Most of them GLARINGLY obvious now. But, as a whole we are worth more than we were to begin with because of our understanding of what we have been given. Thankfully, God is a MASTER of pottery and He can repair us over and over again. He knows that we will never be done being broken and His repairs will only be completed when our lives on earth are done. Imagine though…the amount of GOLD- worth more than the pottery itself- that will exist within us each time we allow God to do His work in us? At the end of our lives, when His finished product is complete. We will be more gold than pottery at that point I would think. We know we are broken. Maybe we exist to allow our brokenness to shine in the glare of a world that remains broken? You wouldn’t take a piece of pottery you loved to be repaired with gold if your intention is to put it in a cabinet and never see the light of day. Yes, displaying it risks the chance of it being broken again. Yes, the cost of repair is not cheap. Good thing the bulk of our heart repair has been paid by the artist himself! Our cost may be high. Sometimes extremely painful. But, I can’t imagine that any pain we endure is what Jesus felt being betrayed, crucified, and serving for us in hell simply because He loved us. He was perfect. Had never made a mistake. Had never hurt a friend. Had never stepped out of line… and yet He took on that price for AN ENTIRE WORLD. How crushing that must have been. It stalls my breath to think about. He did that for me. and you. and those you’ve never met. Knowing that even despite our best efforts… He will STILL be choosing to forgive our brokenness time and time again later. Only the most dedicated and loving of artists could create a piece of art KNOWING that. And yet He did. I think it’s good to be somewhat transparent with the world. They need to know we are imperfect but, being perfected. They need to know that having a relationship with Jesus doesn’t mean being intact forever. In fact it means we may look more broken than anyone else we know… and letting God’s gold pour over us to turn that into something beautiful is a process. I’m pretty sure it takes those artists to while to fix everything. Depending on the crack it may take longer to cure. It isn’t that we are unbroken in the process. It is simply that it is OK to not be Okay and to admit that we are in our humanness still being repaired. It’s important that we allow the world to see the gold amidst the shards. It is our purpose to live broken…and repaired. 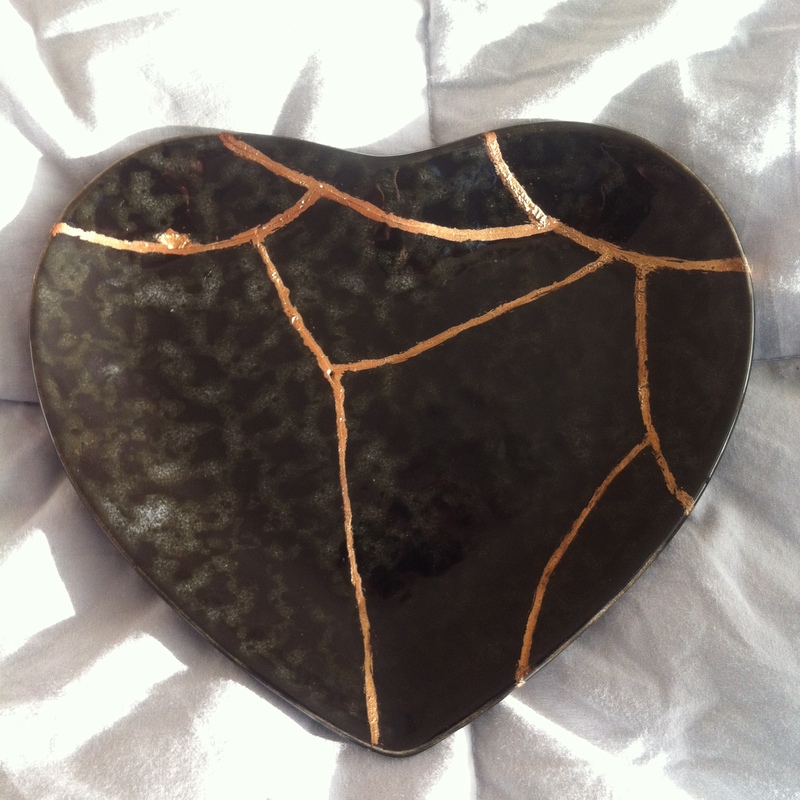 It is our purpose to be the Kintsugi among the broken.